MANILA, Philippines – Some martial law victims on Tuesday raised concern over what they said was an “arbitrary, chaotic and anti-victim” process of the claims board handling the compensation. 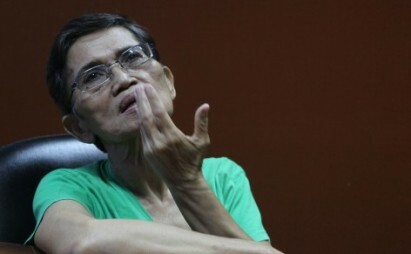 Trinidad Herrera-Repuno, one of the most famous victims of Marcos’ martial law, in file photo. “The claims board asked for too many requirements from the victims, many of which were outright unnecessary and even outrageous. The victims are made to line up without any of the so-called respect that should have been accorded them. Biktima na nga, pinapahirapan pa [They’re already victims as it is, and yet they’re still being made to suffer more],” Marie Hilao-Enriquez, 61, chairperson of the group Samahan ng mga Ex-Detainees Laban sa Detensyon at Aresto (SELDA), said. “Hindi man lang ninyo i-announce ang steps kung ano ang gagawin. Ang gulo-gulo [They don’t even announce the steps claimants should take. It’s chaotic],” she added. She said the board was asking for “unnecessary requirements” such as birth certificates, original release papers for those illegally detained, and two government-issued identification cards, which were not indicated in the claims board application. “Does the claims board realize that we are talking about martial law, that military power took over civilian institutions? How do you expect the victims, many of them farmers and ordinary people, to acquire such documents? How could they ask for release papers when these were not available amid rampant illegal arrests and detention?” Enriquez said. Enriquez aired the sentiments of the group in a news conference Tuesday, together with National Artist for Literature Dr. Bienvenido Lumbera, and Trinidad Herrera-Repuno, one of the expert witnesses in the Hawaii Court. The Human Rights Victims Claims Board was established as mandated by Republic Act 10368 or the Human Rights Victims Reparation and Recognition Act of 2013. The law recognizes and compensates the thousands of victims during the martial law period from 1972 to 1981. A total of P10 billion from the alleged ill-gotten wealth of the Marcoses will be used to pay some 20,000 victims, according to the law. Victims were given six months to apply at the claims board, which started on May 12, 2014 and will end on November 10. Enriquez said she has personally witnessed the process of application in Panay and Bicol regions and in Southern Mindanao, and described it as anti-victim. In Davao, she added, at least four martial law victims, many of them now senior citizens, collapsed in the heat of the sun after being made to wait outside a gym for 20 hours. In Panay, some 800 arrived to file their claims. In the two-day stay of the claims board there, she said, only 268 applications were processed. She said only one to three lawyers were attending to the claimants in each area they went to. “How could they determine who the real martial law victims were?” she asked, recounting how it took her only 15 minutes to file her application, but that she was able to help others whom she knew from her time in the streets. “Sabi ko, ‘Kilala ko sila, bakit kailangan pa ng birth certificate?’ Sagot nila, iyon ang proseso. Sabi ko nga wala kayong Hawaii list. Kung mayroon kayo, makikita niyo kung sino siya, at sapat na ang ID para mapatunayan kung sino sila,” she said. By “Hawaii list,” she was referring to the 9,000-plus victims who won the landmark ruling in a Hawaii court, and whose case propelled the campaign for a local claims board to seek out and compensate thousands of other victims. She called on President Benigno Aquino III to ask from the Hawaii court and make public the “Hawaii list” of 9,539 human rights victims plus 24 direct action plaintiffs for conclusively presumed victims. This, they said, would speed up the claims process, since those on the list would automatically be spared the long process. Successful claimants will be given compensation by December next year, said SELDA national coordinator Jigs Clamor. For her part, Enriquez said she would not be filing for her claim. Lumbera said he was still mulling over whether to file a claim or not this time around. [If one compares what I went through in detention with those of my fellow inmates, I suffered lightly. I wasn’t torture. The worst thing that happened was being repeatedly grilled about things I knew they already know about, such as the names of activists who got positions in government],” said Lumbera. He said he was jailed with his friends and young students. It was they, he said, who were tortured. He was unsuccessful when he filed a claim for the first time years ago. [The narrating was simple enough: what happened when I was arrested. But I realized it is also painful to keep reliving the psychological torture of someone arrested by the military that time],” he said. Nevertheless Lumbera said he was one with the human rights victims who filed their claims.